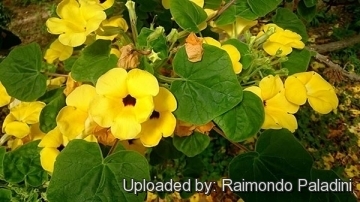 For several weeks in early summer the bare stems of this plant bear a mass of bright yellow flowers. 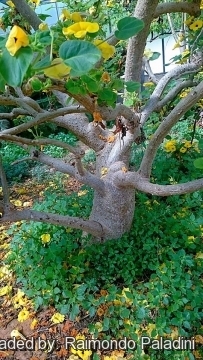 Origin and Habitat: Uncarina grandidieri is native to dry forests of Madagascar. It is dormant during the winter. 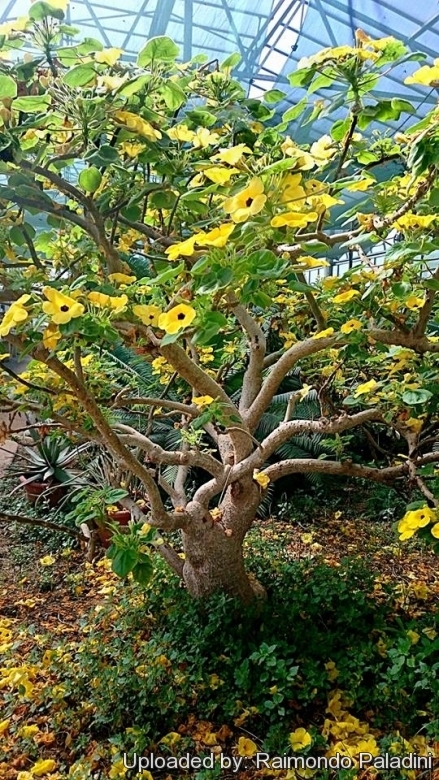 Description: Uncarina grandidieri is a multibranched shrub or small pachycaulescent tree that may ultimately attain a height of 3-5 meters and 80 cm girth. 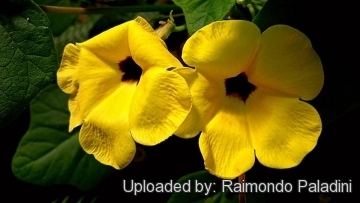 The flower resembles a large Petunia in form and is bright yellow with a dark throat, as in the "Black Eyed Susan Vine" (Thunbergia alata) and give way to green fruit covered in otherworldly spines. The stems are stout and become thickened with age. 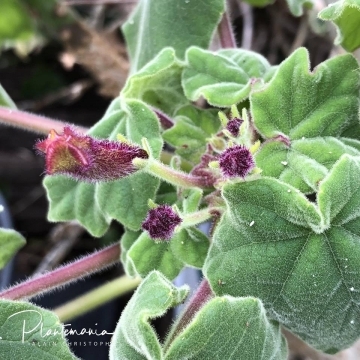 The leaves resemble those of the cotton plant (genus Gossypium) and are fuzzy and are sticky to the touch, yielding a musty odour when rubbed. The leaves are deciduous during the winter resting season. Derivation of specific name: The species is named in honour of Alfred Grandidier (1836-1921), an intrepid explorer and collector in Madagascar. Stems: The stems are stout and become thickened with age. Leaves: Long-stalked, three- to five-lobed, more or less sticky-hairy with blades of variable outline, up to 12.5 cm long by 15 cm broad. Those on flowering shoots are smaller than the others. 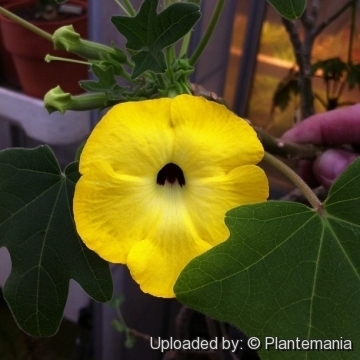 Flowers: In Clusters on young shoots, the flowers have a calyx of 5 sepals, and a 6 cm long corolla with a narrow tube and an oblique face of 5 wide-spreading, somewhat unequal, about 2.5 cm long, rounded, bright yellow lobes (petals). The throat of the flower is stained with purplish-red. These are four fertile stamens, one rudimentary staminode (sterile stamen), and one style. Fruits (capsules): Flat, pointed (hence the common name, unicorn tree) that are covered with small inwardly pointed spines mounted on 18 mm pedicels. Each spine has a tiny hook an the end; as the fruit dries, the remaining seed pod becomes a real hazard. Remarks: Uncarina grandidieri is similar to Uncarina decaryi, but with larger flowers and not deeply lobed leaves. 1) San Marcos Growers contributors Uncarina grandidieri - Succulent Sesame San Marcos Growers <http://www.smgrowers.com/products/plants/plantdisplay.asp?plant_id=2479>. Web. 10 June 2016. Cultivation and Propagation: Uncarinias are easy to cultivate and heat resistant plant, which grow better than the average. Their attractiveness is further enhanced because they will flourish very easily in any pseudo-tropical environment. They can tolerate neglect, and as soon as you pay them a little attention (like repotting or fertilizing) they recover and put out plentiful new growth. They will tolerate intense heat and sun, when provided with adequate water, but must be protected from frost. 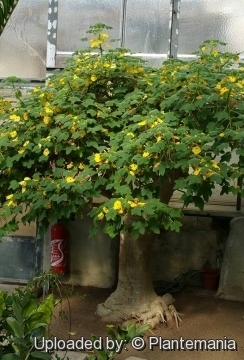 Uncarinas make beautiful bonsai, and their roots can be elevated. Growth rate: These plants can grow quite quickly if provided with adequate water, warmth and root run. Soil: It needs a rich, very well drained potting medium (add pumice, vulcanite, and perlite. Waterings: It should be watered plentifully in Summer and kept drier in Winter. This species like all Uncarinias, is sensitive to excess moisture, and should be kept on the dry side. 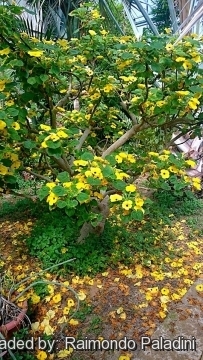 It rot easily and do not like any water when it has no leaves. Fertilization: Use diluted fertilizer on young plants to speed up growth. Hardiness: Due to their Madagascan origin keep warm in winter, the minimum safe average temperature is 10°C, although they can go lower for short periods (cannot endure temperatures below 2° C). If grown outdoors they will probably grow back from roots, if frozen. They are quite heat tolerant, and survive easily temps above 45° in summer, without dropping leaves. Bonsai/caudex culture: Lifting the thickened root system periodically creates a cool, gnarled bonsai look. Warning: The seed pods are covered with barbed hooks. Don't touch this fruit unless you want to spend some time trying to remove it from your fingers. Remove the pods when they are still green and pliable (if they are dry, use long-handled clippers or hemostats) and dispose of carefully. Reproduction: Seeds, and they can be reproduced by cuttings as well.